When I found my job 16 years ago, I searched for positions in newspapers, newsletters and magazines. I was mailed job openings from various organizations, snail mailed potential employers a biographical resume and cover letter, arranged interviews on the phone, and didn’t worry about what was floating around in cyber space that might flummox my chances for the dream job. I learned very quickly that job search protocols and tools have changed dramatically in the intervening years. I also discovered that while schmoozing has always been part of the job search strategy, now it has an official name and rules to live by – it is called Networking and people make their living teaching others best practices. So began what seemed to be an Odysseus-like journey to find my next great opportunity. On this quest, I learned things about myself, met wonderful people and adopted work habits that I will adhere to for the rest of my career. What follows are some hints and thoughts to help the next person who finds themselves in my position. Your resume: keep it current! Research what the prevailing thinking is on good resume design and content. There are lots of opinions out there so if confused, speak with a job coach or ask respected colleagues if you can see their resume, and then create your accomplishment driven resume. LinkedIn: one could write a book and no doubt someone has. Keep your profile up to date. 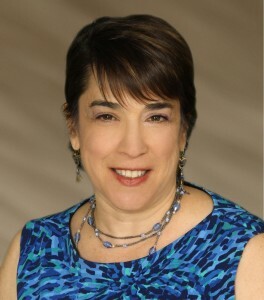 Please have a picture of the professional you as your profile likeness! Join groups. Comment on the discussions posted in groups. Start a conversation. Be an active participant not a virtual wallflower. Share your recent projects and accomplishments. Recruiters and hiring managers are increasingly mining LinkedIn to fill open jobs. It happened to me! Sadly it didn’t lead to a job but it was a fine ego boost. Networking: it doesn’t come easily to me. I don’t generally like asking for help and am somewhat modest in talking about myself. The work speaks for itself –right? However it is a necessary skill to have in this new, tight job market and connected world. Today, 50-70% of jobs are found on the hidden, who-you-know job market! So for the past few months I have been seeking AIR — Advice, Information and Referrals. Networking is never, ever about asking for job! It is about letting the world know you are available and being introduced to the decision makers. My networking experience has been a sheer and unexpected pleasure 97% of the time. I became reacquainted with former colleagues, got easy access to great art exhibits, practiced some sticky interview questions with smart and tough colleagues, expanded my network, spent time brainstorming where else to work besides museums, found a couple of great job coaches, and visited neighborhoods that I might never have seen otherwise. For part of this time, I also got to be a rockin’ Auntie, because for two weeks my silent companion on this adventure was Flat Emily. 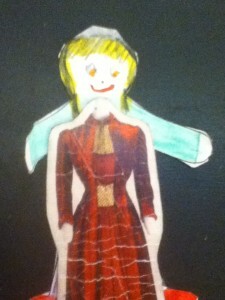 She was a paper doll that my niece Emily sent to me so that I could share my world with a class of third graders in North Carolina. Flat Emily went with me to Crown Heights and tried on a Victorian dress at the Brooklyn Children’s Museum. She also got to witness the joy that overtakes the Hasidic community on the holiday of Sukkot. At the Met, Flat Emily held hands with an Egyptian. On an MTA map and illustrated with plenty of photos, I traced my path with Flat Emily on the subways, suburban trains and sidewalks of New York. I covered ground and that is just what you have to do when in job search mode; so you might as well find the goodness in the quest. Flat Emily trying on a Victorian dress at the Brooklyn Children’s Museum. Holding hands with an Egyptian at the Met. 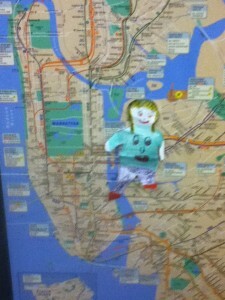 Flat Emily mapping a path on the subways and sidewalks of New York. As 2013 ends and 2014 begins, I am still on the path to my next great opportunity. Like my fictional friend, Rip Van Winkle, I realize that the present is good and getting better. I will also never be caught behind the times again. And of course if you have some AIR send it my way. I will pay it forward. One Response to "Job Hunting with Flat Emily"
Thanks for the great post, Dina– it is perfectly timed for me. I am starting a hunt while at my current institution (I have a six month “transition period”- it’s a weird situation), so I am trying to find a good balance of moving on and finishing up. One of the things I am struggling with is AIR with colleagues (in the art field and beyond) and how to send a first “let’s get coffee” email– especially when I feel somewhat awkward and concerned I may be viewed as pigeonholed in my current role. Any tips or advice on that first email and conversation starters would be greatly appreciated. Again, thanks for the entry and congrats on your successful journey!